[miau] Universally called a crowd favorite in the realm of online slot machines, Beez Kneez is a colorful, playful game that people simply cannot get enough of. The original game wasn’t anything special, just 3 reels with 1 payline; however, the game itself has since grown into something much larger, with a fan base that is now in the millions. 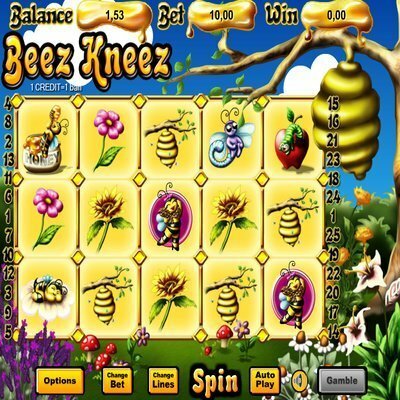 Today’s version of Beez Kneez consists of 5 reels and 25 paylines, making it exponentially larger than the original version, and also one of the biggest games around for its particular function. Full of scatters, triggers and bonuses, Beez Kneez is definitely a contender on every casino for the best slots game. Besides the cool play features, one of the first features a player might actually notice about the game is the vivid, high-quality design. One might liken Beez Kneez to Jerry Seinfeld’s Bee Movie, with its bright and colorful depictions of bees. There are many different colorful symbols on the slot machine, including Worker Bees, Hives, Flowers, Strawberries, and much more. If you happen to hit any comb symbols, you may earn some free spins. If you hit any Worker Bees or Cocoons, these are scatter symbols that rearrange your reels and give you a bigger chance of triggering the 100x total bet. Many slot machines out there offer up 5 free spins, or maybe 10 if they’re generous. Beez Kneez puts these games to shame by offering up to 25 free games with 3x payouts. The scatters are also wild, meaning you have increased odds of winning paylines as well as bonus spins. And if you manage to land a scatter on a line with Dancing Bees, you can win up to 10,000x your initial line bet. The average return to a player is over 95%, so this game is perfect for people who like to gamble without having to risk a lot of money. Beez Kneez has some pretty unique betting options, in that you’re not locked into any type of straight bet. You can bet per line, deciding the amount of money you want to wager per individual line, or you can bet X amount on all lines. It’s also very easy to move your bet up or down, or to place a max bet. And if you’re unhappy with your betting structure, just click the Change icon and rearrange your bets. There’s also an autoplay feature if you’re satisfied with your bets and just wish to spin through a few games quickly. The premise of Beez Kneez isn’t winning any awards any time soon for cinematography or originality. But if you’re a fan of bright, colorful games that are fun and basically pop off the screen in HD, Beez Kneez is definitely something to look at. It’s also very easy for beginners to get the hang of. If you don’t feel like risking a lot, or if you’d rather bet per line instead on all lines, you can easily custom-tailor your bets while playing. You won’t have to worry about being locked in; each new spin gives you different ways to bet. And with so many different scatters and wilds, you also get many ways to win.